What is it they say about summers in San Francisco? I know what it is – they're cold! I flew into SF today and then took the BART to Berkeley. It is much cooler here, even inland. I love it! I'm staying with Lynn, my editor and friend, and her husband Glenn. Tomorrow I'll be at C&T for a photo shoot for the next book. It's my hands that will be in the photos so I need to lotion them up before bed. I meant to post on Sunday but events got in the way. Christy is back in the hospital with an abscess at the surgical site. For a couple of days it was particularly bad, now it's just bad. She is getting better but she's probably going to need to be in the hospital for a while. The wound needs professional care. Steve got the front step finished at mom's on Sunday. I helped a bit, but he did the majority of this work. The step is finished now, the forms are off, and it works. One more thing marked off the list. On my way out of the SF airport I stopped at the cutest little shop. I got some Christmas presents, I didn't buy one of these guys. But I may on my way out of town. I don't know what it is about robots, but I'm hooked. Lynn and I did a bit more shopping. I stimulated the economy of CA a bit. 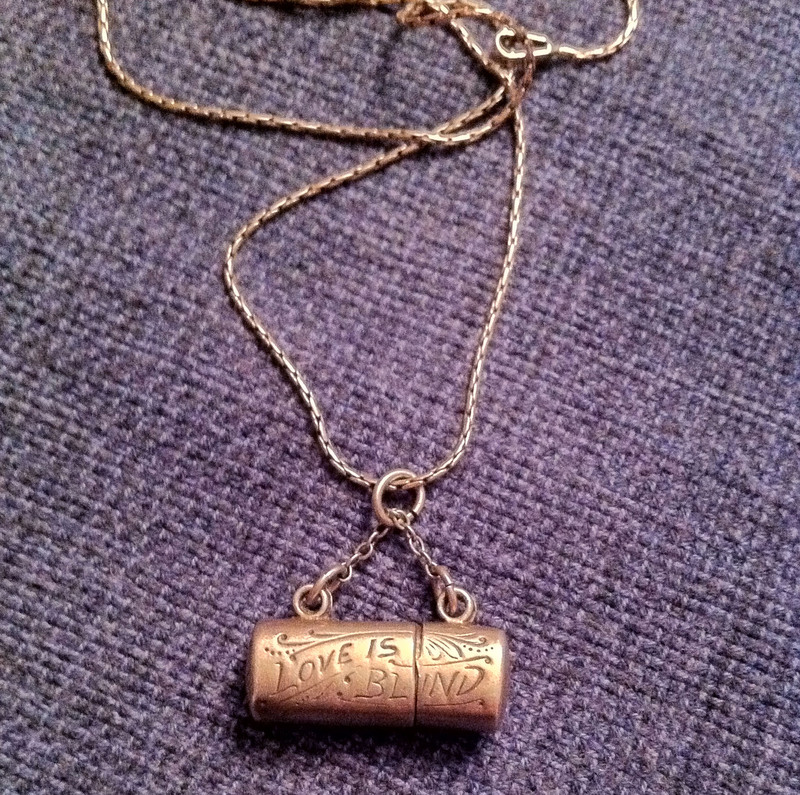 One thing I found was this vintage silver charm that says 'Love is blind". I know it looks gold, but it isn't. The little case opens up to reveal a bitty pair of wire glasses. The chain is vintage as well. I love it and I'm sure if Steve had been there he'd have insisted I needed it! Seriously, how could you pass this up? 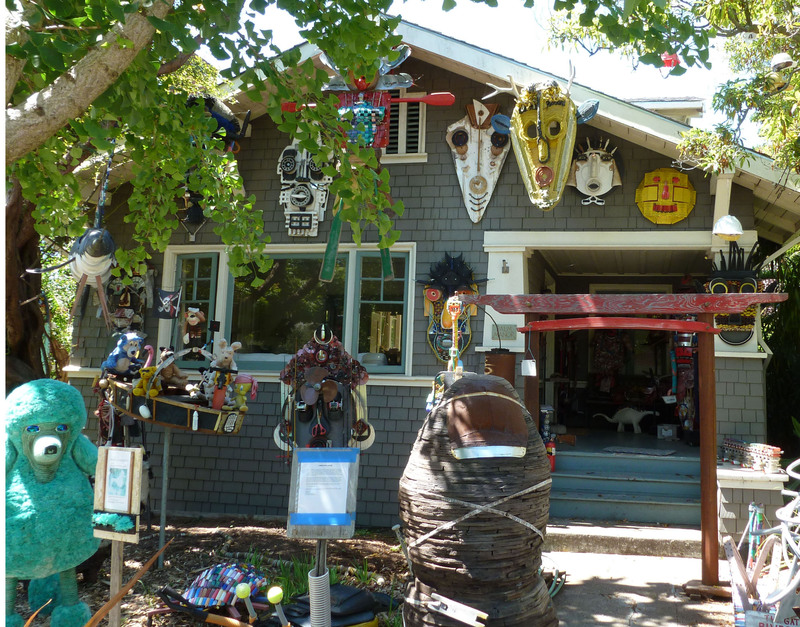 Lynn drove me by this 'art house'. 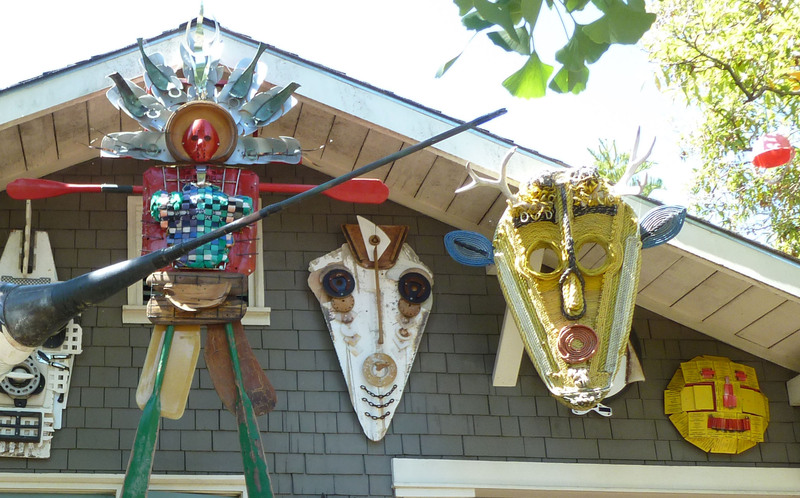 The owner makes sculptures from found stuff. 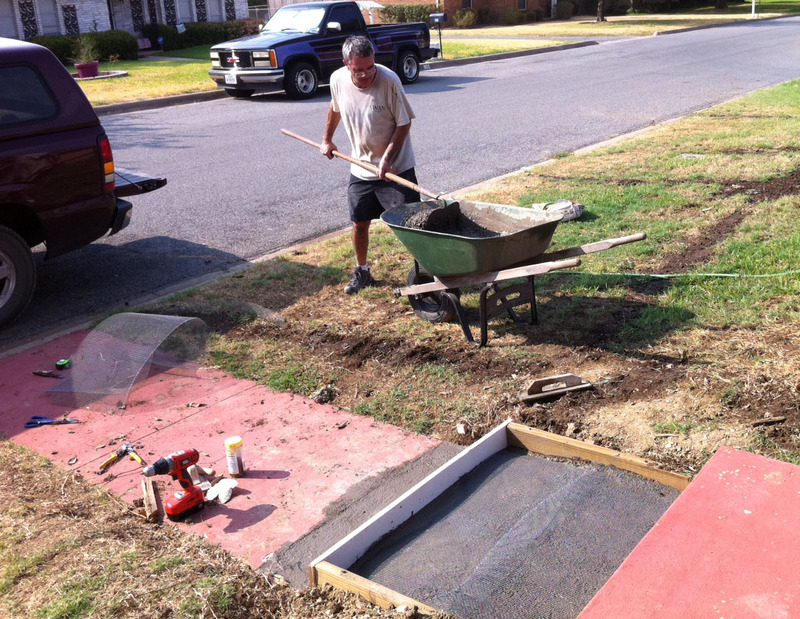 At least of few of neighbors like his work too – it spills over into other lawns. I especially love the masks. The rope elephant is great, as was a turquoise poodle. 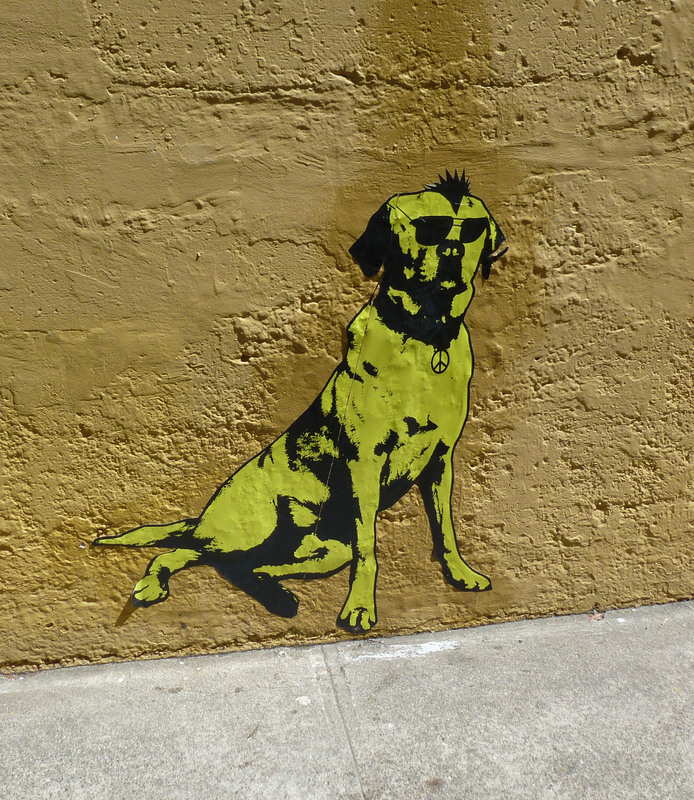 I found this dog decoupaged to a wall outside of a salon. It reminded me a a similar dog (or cat?) that I saw in Paris. I need to put one of these on my house somewhere. Maybe the garage door? 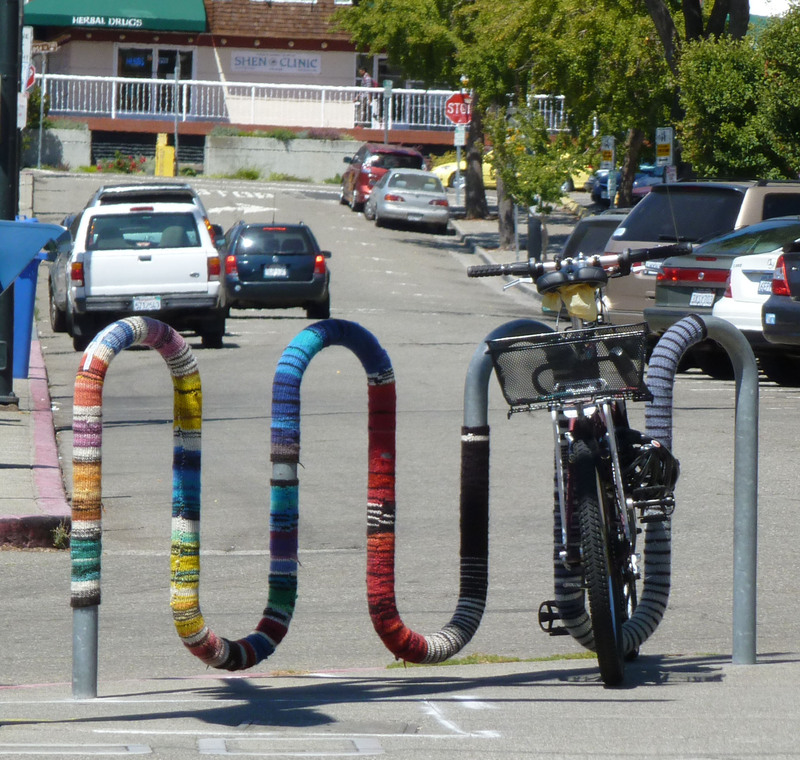 This bike rack with the guerilla knitting is fun. I can't think of anywhere in Sherman where I would find any of these things. If only I had more time, I'd funky up my own yard. We went to Chez Panisse for late lunch. It was so very good! We each took photos but this is the only one that came out. 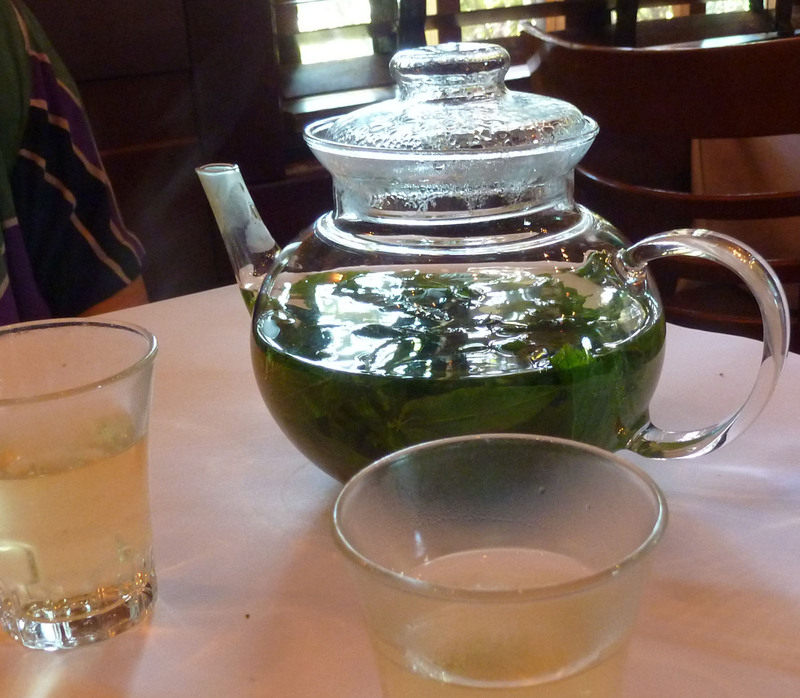 We ended the meal with a mint infusion. I have mint growing at home and must remember to do this. It made us both happy. And then there are the flowers. 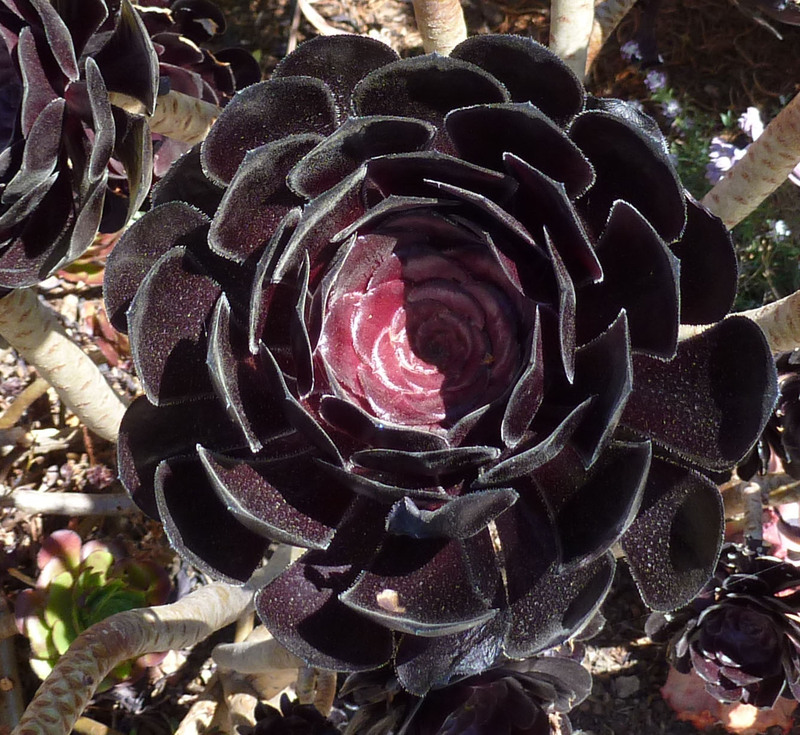 It's so hot at home – the flowers are not as plentiful. I should know what this fuzzy thing is, but don't. I liked it against the red car. 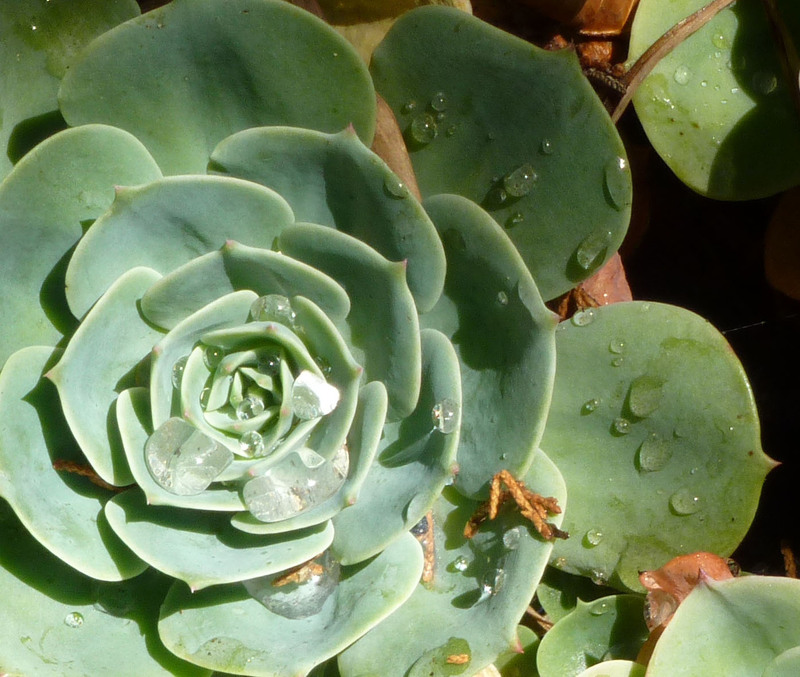 There are lots of succulents in yards here. I don't think they will grow this well in our hot weather and clay soil. However, if they would, I'd plant some. 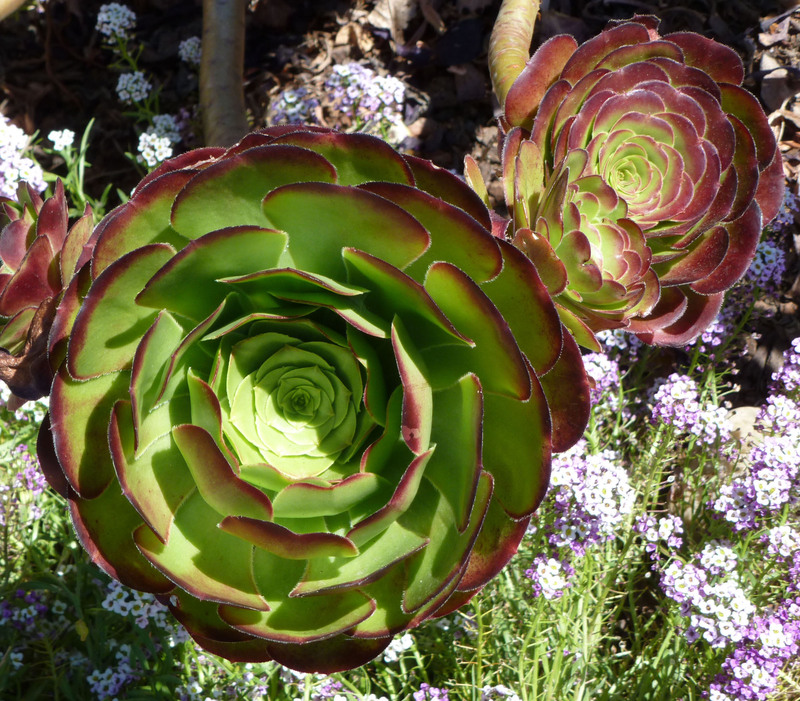 I love the circular growth pattern. It's rhythmic. 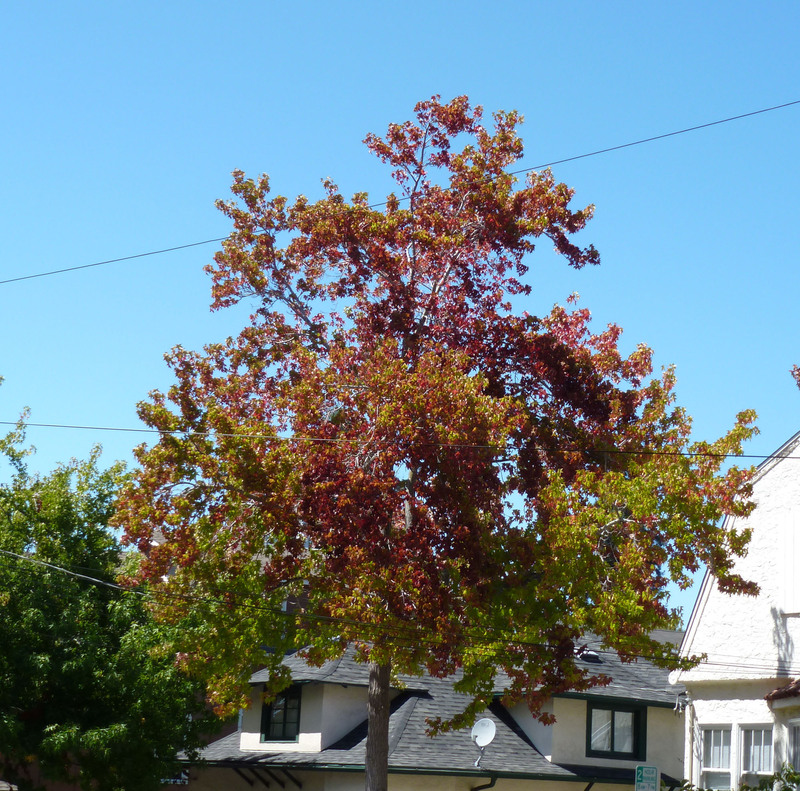 And lastly, there are trees who think it's fall. Lynn says it's very early for this sort of color. At home it's so hot that trees are dying all over town. Don't know what our fall will look like. That's it for today. I'm heading off to bed. 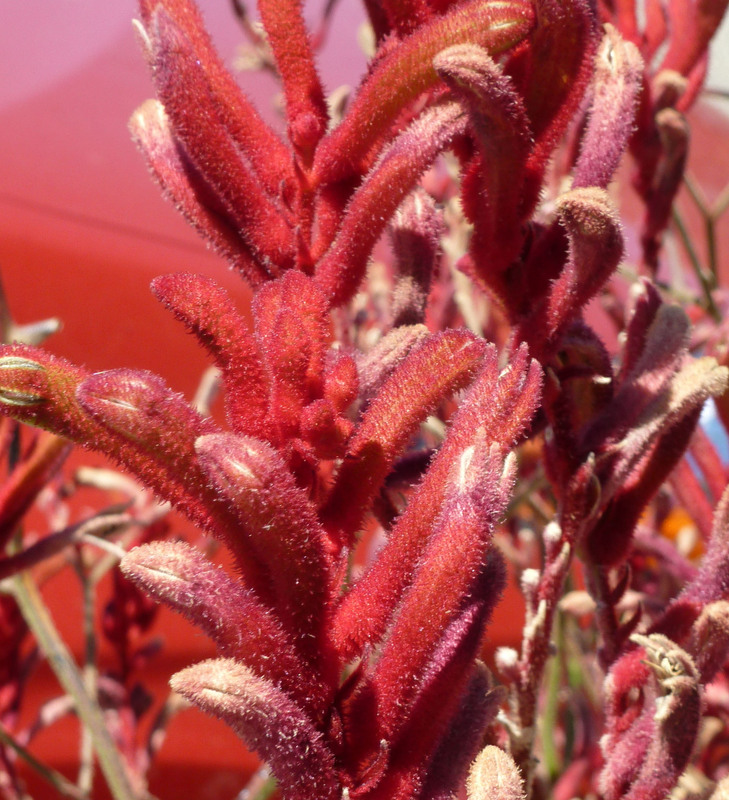 The red fuzzy flower looks like Kangaroo Paw (Anigozanthos species) an Australian native species. I second the notion that it is Kangaroo Paw. I hope your sister improves quickly. 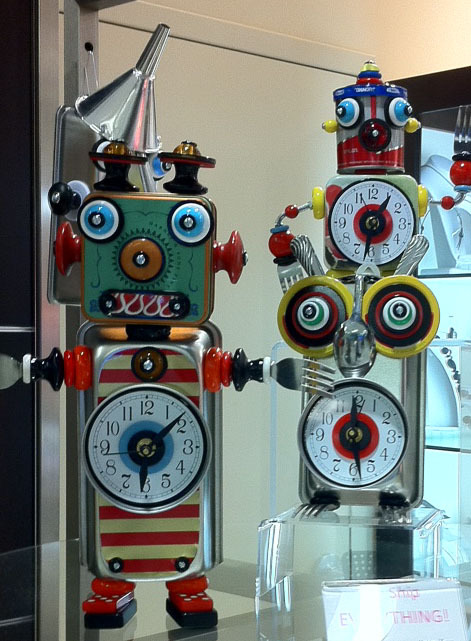 I love the robot clocks! It would be so cute in my 17 year old robotics student’s room. I will have to google those! Glad you’re enjoying the nice weather (and the random art). We’re having a much cooler than usual summer this year (in the Bay Area), and I’m not complaining one bit. I don’t miss those Oklahoma summer at all. And, yes, things grow here that wouldn’t in hot weather, except for jalapenos, those like it hot. Enjoyed seeing you this past week and being in your class. Your blogs are so great. I hope your sister will start feeling better and enjoy your trip in Ca. Did you get to take your bike ride Sunday? I did indeed ride my bike. Im hoping to get a good photo of it soon, maybe with me on it, so that I can post it to show you all. Its a very nice bike and I do love it!